Breaking into Comics Vol. 3 – Branching Out! A panel of industry experts including an illustrator and filmmaker Lewis Peake, indie game programmer Tom Vian and games artist/illustrator Adam Vian of SFB Game Studio, Manager at Gosh Comics in Soho’s Berwick Street Andrew Salmond, founders of Mayamada, (www.mayamada.com) Nigel Twumasi, a new company that blends the best of Looney Tunes, Japanese TV and British streetwear. The last episode of a perfect event for comic book fans, budding writers and artists and for those interested in creative literature with a view of gaining advice on self-publishing and insight into the creative process. Followed by Q&A with audience. Lewis Peake – is an illustrator and filmmaker based in London. In 2005 he began set design work at Tandem Film studio. Since then he has worked on a variety of projects including feature films, commercials and television dramas. He has practiced many disciplines in the set design department, creating an array of illustrations in the process. Working on his personal projects, as well as using traditional media, many of Lewis’ paintings begin as sketches drawn on his iPhone whilst on the London Underground. These are then used as a base layer, painted over and textured using digital media. Lewis is currently working on a series of shorts and aims to make his first feature in 2016. Adam Vian – Illustrator, animator and Flash Games designer of SFB Games he is also the man behind the delightful all-ages fantasy Long Lost Lempi. Tom Vian – As the programming half of SFB Games, Tom Vian has been making games with the artistic half – his brother Adam – for over 13 years. Since 2012, they’ve branched out from browser games and found success on mobile and Steam with their games Haunt the House: Terrortown and Detective Grimoire. Andrew Salmond – The Manager of Gosh! Comics, a comic specialty store in the heart of London Soho. With nearly 20 years experience in the comics retail industry both in the UK and in his native New Zealand, he has extensive experience buying and selling self-published comics. 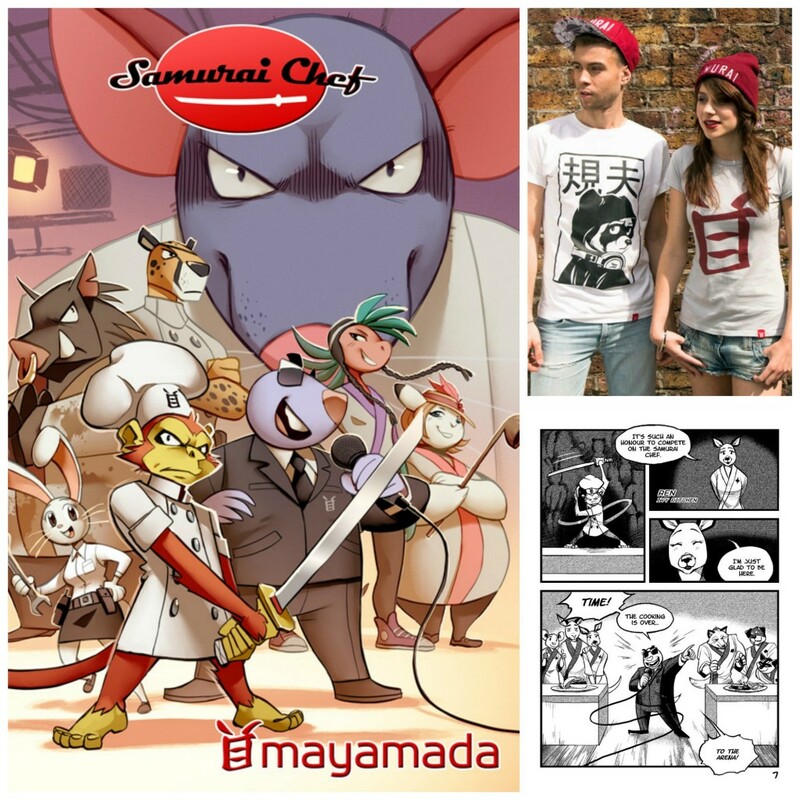 Nigel Twumasi and Lao Karunwi are founders of Mayamada, a new company that blends the best of Looney Tunes, Japanese TV and British streetwear. They produce their own line of clothing, comic books and even uniquely flavoured chocolate bars all bearing the faces of their own characters. Technology graduates turned entrepreneurs, Nigel and Lao use anime and manga to create a universe of unique characters engineered to inspire their community. They plan to develop their colourful ideas into a series of books, toys, games and before you know it, animated shows.